>> Extra Inning Run Generation: In an effort to manufacture runs late in tied ballgames that have exceeded regulation, the WBC will place baserunners at first and second base to begin the 11th and any subsequent extra inning. The runner at first base will be the player in the batting order immediately preceding the batter, and the runner on second will be the player preceding the runner at first base. Example: With the score tied after 10 innings of play, A7 (the player listed seventh in Team A's batting order) leads off the top of the 11th inning with A6 (listed sixth in the order) at first base and A5 (listed fifth) at second base, with none out. Clint Fagan at 2012's WBC qualifier. 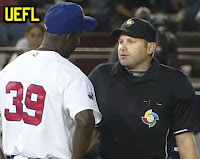 >> Video Replay Review: Due, in part, to technical and logistical limitation of some venues not ordinarily used by MLB, instant replay in the First and Second Rounds of the tournament will be effected in the same "limited replay" variety used by Major League Baseball from 2008-2013: The umpire crew chief may only review plays involving home runs or potential home runs (fair HR/foul, in play/HR, fan interference/HR, etc. ), and the crew chief will conduct the review in the stadium himself with the assistance of a crewmate. For the Championship Round, taking place at Dodger Stadium, an MLB park, "expanded replay" (2014-present) will be used with the exception of manager challenges. Example, Rounds 1/2: Batter A1 hits a fly ball above the height of the left field foul pole, ruled a foul ball. The crew chief and third base umpire retreat to a field-adjacent video monitor or room and determine the call on the field was correct. Foul ball. Example, Championship: Same play as above. The crew chief and third base umpire will don headsets and speak with a Replay Official, who will make the final ruling. Example, Rounds 1/2: Batter A1 hits a fly ball to outfielder F9 who attempts a diving catch, after which umpire U1 rules the ball was trapped (A1 safe at first base). This play is not reviewable. Example, Championship: Same play as above. 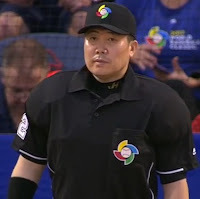 The crew chief and first base umpire will don headsets and speak with a Replay Official, who will make the final ruling. - 1) Fewest runs allowed divided by number of innings played on defense (Runs per Innings). - 2) Fewest earned runs allowed divided by number of defensive innings (Team ERA). - 3) Highest team batting average. - 4) "Drawing of lots," or the WBC-controlled coin flip. Example: Team Korea and Team Israel are the only teams tied for Pool Winner designation at the conclusion of the First Round; whichever team won the pair's head-to-head matchup will be the Pool Winner. Kun Young Park at the 2016 qualifier. >> Designated Pitcher Pool: Each team will identify a list of 10 pitchers eligible to participate in one or more consecutive rounds (e.g., a pitcher may not participate in the First and Championship, but not the Second Round). This list is independent of any roster submitted to WBC ahead of the tournament, but in order to use the pool list, the submitted roster must include a minimum of one and maximum of two pitchers from the pool list (if no pool pitchers are included on the roster, the pool list may not be used for the tournament). If a pitcher is removed from a roster at any time, the pitcher may not be used again in the tournament. Pitchers from the pool list, if used, may replace pitchers on the WBC roster after each individual round of the tournament. Example (Legal): Team Canada names Pitchers 1-10 to its Designated Pitcher Pool list, and adds Pitchers 1 and 2 to its First Round roster. At the conclusion of this round, it replaces Pitcher 1 with Pitcher 3, such that Pitchers 2 and 3 compete for Canada in the Second Round. At the conclusion of the second round, Canada replaces Pitcher 3 with Pitcher 4, such that Pitchers 2 and 4 compete in the Championship Round. Legal. Example (Illegal): Team USA names Pitchers 1-10 to its Designated Pitcher Pool list, and adds Pitchers 1 and 2 to its First Round roster, replacing them with Pitchers 3 and 4 for the Second Round. Team USA attempts to reintroduce Pitcher 1 in the Championship Round. Illegal, since Pitcher 1 may only compete in consecutive rounds. Example (Illegal): Team Korea names Pitchers 1-10 to its Designated Pitcher Pool list, includes Pitchers 11 and 12 on its First Round roster, and attempts to replace Pitcher 11 with Pitcher 1 for the Second Round. Team is prohibited from using the Designated Pitcher Pool, since it did not include any pitchers from this pool on its submitted roster for the First Round.